Lichens can live in space! That's the news from the ESA (European Space Agency). 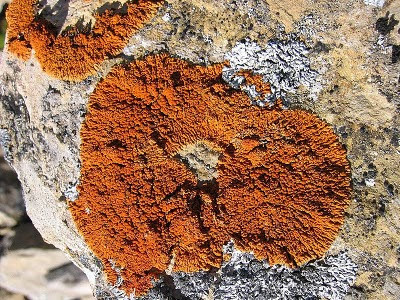 The lichen species Xanthoria elegans successfully survived for 18 months on the exterior of the International Space Station in an experiment where it was exposed to the vacuum of space as well as wild temperature fluctuations and bombardment by cosmic rays and high levels of UV radiation from the sun. It is pretty incredible that something could survive all that. Space is one of the most hostile environments to life you can imagine. Humans would die extremely quickly in exposed space. Let's be clear though, the lichen wasn't really growing, it was just surviving. Lichens have the ability to wait it out of conditions aren't just perfect for growth. Show me lichens growing in space and then I'll be completely blown away. Maybe I'm reading the reports wrong but it seems like the lichens just shut down and waited for conditions to improve. Xanthoria elegans is a foliose lichen that grown on rocks. It is clearly very adaptable as even here on earth it is found in habitats as diverse as grasslands, sea shores and boreal forests. I'd be very interested to see an experiment where lichens are sent to mars to see if they will grow in the thin martian atmosphere.